Happy Kitchen Sink Stamps Monday, I'm so glad you stopped by today! It's time for another challenge in the Kitchen, this months Hostess is Angela. Her challenge is to use your KSS images and create a square card, the more squares, the better! After you create your KSS Square post, head over to the KSS Blog and leave your comment for a chance to win some KSS Gift Certificates. We'd love to have you play along! 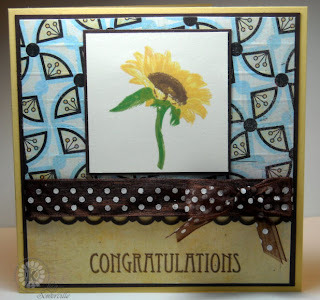 Here paired up the Multi Step Sunflower from Kitchen Sink Stamps with the beautiful Kioshi paper from Basic Grey. To add some texture to the top paper, I scored the paper every 1/2" rotated the paper and scored again in 1/2" increments. On the bottom panel I stamped the sentiment from Simple Sentiments in Memento Rich Cocoa. 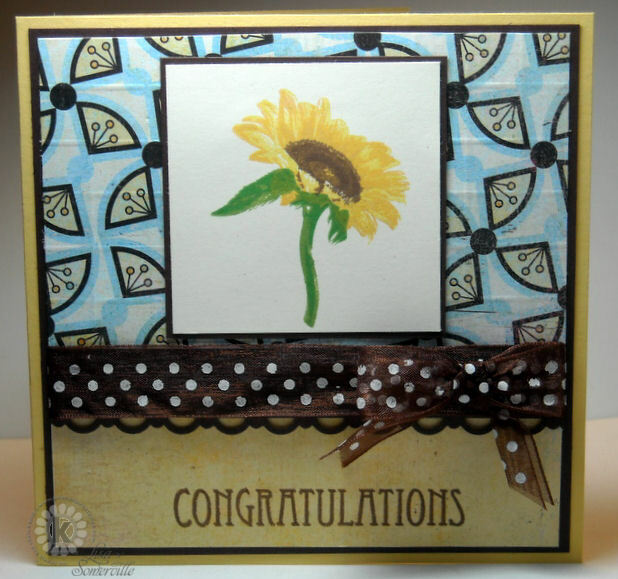 The sunflower is stamped on Vanilla card stock. What a beautiful sunflower creation with your wonderfully scored background!! Awesome work, Lisa!! So beautiful, Lisa!! Love the scoring...what the perfect touch for this challenge!! Lisa, this is so beautiful!! I love the DP with scoring - gives a wonderful touch! Just beautiful, the sunflower pops on the beautiful BG! Lisa--this is super cute! Love the scoring--note to self: try scoring on cards!